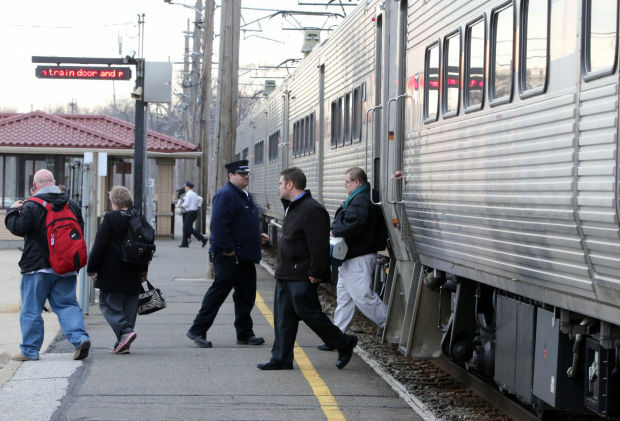 Passengers get off a South Shore train at the Miller stop. The stop is being targeted for big improvements by the city of Gary and South Shore operator Northern Indiana Commuter Transportation District. Northwest Indiana’s ambitious plans for commuter rail expansion and developing vibrant neighborhoods around train stations face financial hurdles because of a lack of local funding sources. Enterprising plans for the same kind of development around Metra stations in Illinois have turned into reality only when local officials have swallowed hard and plunged in, often using local taxpayer funds to leverage private development, according to officials there. In Orland Park, officials did that four years ago when they approved borrowing $63 million to have a developer build the five-story Ninety7Fifty luxury apartment building adjacent to its 143rd Street Metra station, said Karie Friling, Orland Park director of Development Services.